Well, let’s drop a bomb from the start: sushi didn’t originate in Japan. Although we all recognize it as coming from the land of the rising sun and that is in fact where the rolls and cones we enjoy today originated, the act of combining fish with rice (meant to preserve the meat) was invented in Southeast Asia and came to Japan in the 8th century. Sushi in Japan began as a fast food, served at stalls on the street before moving into restaurants and bars. Let’s keep the game changers rolling along (get it? 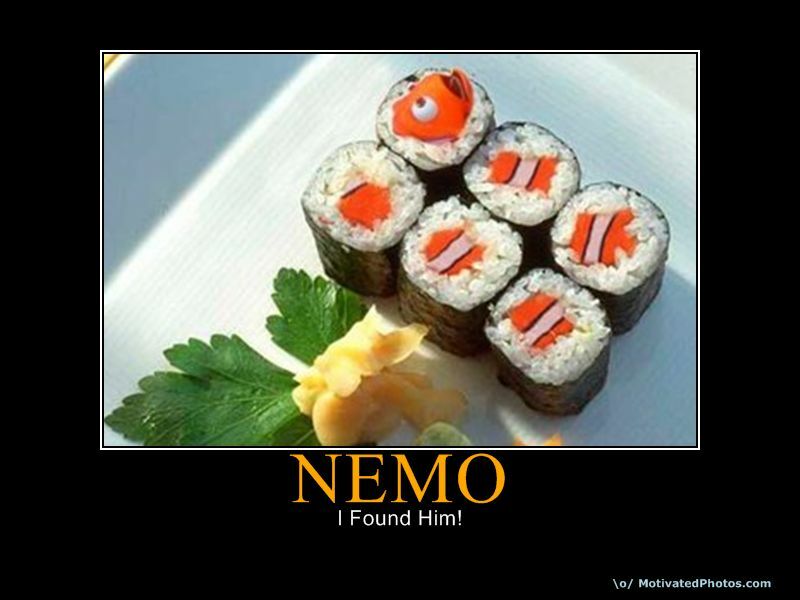 A sushi pun!) with this doozy: sushi doesn’t necessarily mean raw fish. It actually describes the rice, mixed with vinegar, sugar and salt, to make sticky rice, although actual sticky rice is a completely different creation. Still with me? If you have aspirations of becoming a sushi chef, you likely want to do it anywhere else than Japan. There, hopeful cooks spend two years learning the ins and outs of making the rice, followed by three years working with the fish before their apprenticeship is passed and they can go to work behind a sushi bar. The honour and traditions don’t stop there. Sushi knives come from legendary samurai swords and the blades are sharpened and reshaped each day. While westerners recognize sushi as being made up of rolls, the Japanese more commonly equate it to the nigiri pieces. Sashimi, of course, means sliced meat and can come in varieties such as beef, chicken, and various vegetables, to go along with all the seafood choices. The preparation of octopus for sushi often includes a full-body massage by chefs, while the animal is still alive. This proves, once again, that food lives better than the Sip Advisor does! Although I dislike any ginger or wasabi with my sushi, I may have to reconsider. The ginger acts as an antibacterial for the raw fish, killing parasite which may exist, while also cleansing the palette between pieces. Wasabi, meanwhile, has anti-microbial assets and can decrease the risk of food poisoning. Researchers have even used wasabi as a smoke alarm for the deaf, spraying its vapors into a test room, where subject awoke promptly, much like the effects of smelling salts has on a person. This discovery was awarded with the 2011 Nobel Prize in Chemistry. In most western sushi restaurants, the wasabi you are served isn’t actually wasabi at all. It is a combination of horseradish, mustard, and food colouring. Real wasabi powder is quite expensive, ranging from $50-$100 per pound, making it likely that you would only find it in an upscale joint, if you’d find it at all. I’m not a fan of the green stuff, so this has no impact on me whatsoever, but it kind of makes me feel bad for always throwing out the booger-looking lump… it may have intrinsic value! Nyotaimori is the act of eating sushi and sashimi off of a naked female model, while Nantaimori, refers to the same practice involving males. Models have to be trained to lie still for hours at a time and be made accustomed to the cold food that will sit on their torso. The deed is popular with members of organized crime in Japan. 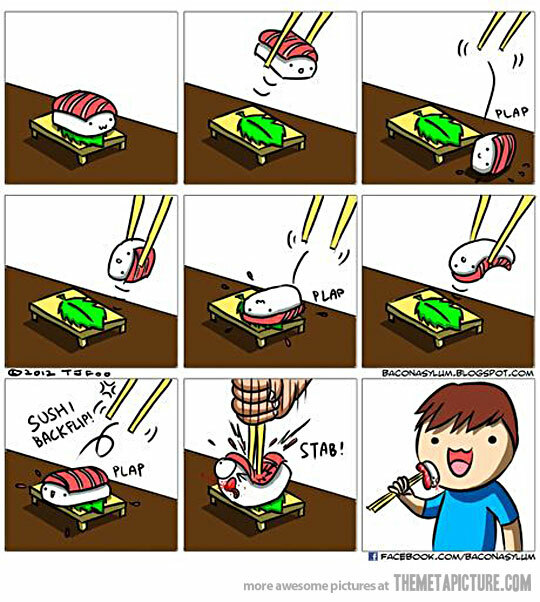 I once asked Mrs. Sip to be my sushi tray… poor girl ended up with soy sauce in her eyes! 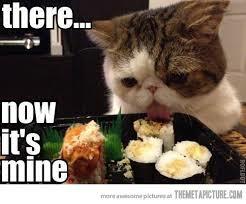 For most young westerners, their first experience with sushi may have been the episode of The Simpsons, ‘One Fish, Two Fish, Blowfish, Blue Fish,’ where Homer is introduced to the Japanese fare and falls for it so hard that he even requests the poisonous fugu (or puffer fish), which must be dissected perfectly in order to not poison the eater. Although the staff believe that Homer ate the poison (12 times stronger than cyanide) and has only hours to live, he survives his brush with death. That happy ending was not shared by Bandō Mitsugorō VIII, a Japanese Kabuki actor and ‘National Treasure,’ who died after consuming four servings of fugu liver, believing that he was immune to the toxin. Each year, a handful of deaths occur after fugu servings and by law, only licensed chefs should prepare the potentially poisonous fish. Even the Emperor is banned from eating fugu. 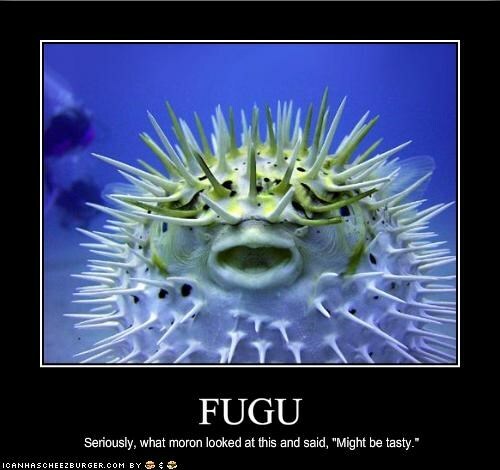 Even when not taking the fugu challenge, folks should be cautious about their sushi consumption. Large doses of tuna can lead to mercury poisoning and should be avoided by women who are pregnant or planning to be and young kids. The warning makes it sounds like an amusement park ride… one that I want to be on! All raw fish portions come with the inherent risk of parasites, but it’s a risk that must be taken. Speaking of tuna, it was once very unpopular and was looked down upon in Japan for being bad luck to eat and a lower class food item. Once a sushi chef named Hanaya Yohei began marinating the ‘chicken of the sea’ in soy sauce, it became a popular menu option. Today, many places around the world have contributed a roll to the sushi lexicon, including Alaska, British Columbia (hey, that’s where the Sip Advisor gets his sushi! ), California, Philadelphia, Seattle, Michigan, Hawaii, etc. Does it say something about the eater depending on which location they choose to order for and represent!? The seaweed wraps used to bind sushi rolls were originally formed from algae scraped off docks, but nowadays, the element is mass-produced through farming and sold to restaurants in packaged sheets. The seaweed is edible on its own and is sometimes served as a snack closely resembling potato chips, I guess. I mean, I’d much rather have potato chips, given my affinity for the grub, but who am I to criticize. I absolutely love soy sauce and probably use way too much of it while eating sushi. Interestingly, there is actually soy sauce etiquette… protocols which I have certainly broken and likely offended sushi chefs. First, eaters should only coat the top of their piece with soy sauce, as the condiment is meant to enhance the topping, not the rice. Also, the rice absorbs the sauce quickly and can crumble as a result of getting wet. Finally, sushi prepared with other sauces should not be dunked into soy sauce. The most expensive sushi ever served was five pieces of nigiri garnished with diamonds and wrapped in 24-karat gold leaf. It was made but chef Angelito Araneta, Jr. in the Phillipines and came in at a whopping price of nearly $2,000 US. Araneta has gained a reputation as the ‘Karat Chef,’ for his lavish creations. Beginning your meal with a nice hot bowl of Miso Soup seems common, but the Japanese actually end their feast with this dish, as it aids in digestion. Now, enough of this talk about food. 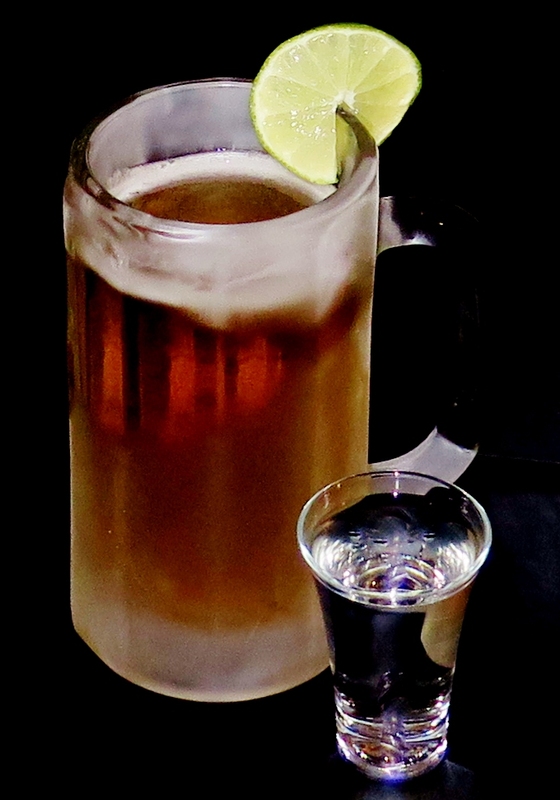 Let’s get to some drinking, while we wait for our order to be served! Sushi combos have grown in leaps and bounds as the western world latches onto the fad. I once had a chicken strip roll that was drizzled with honey mustard sauce and was spectacular. There are also known recipes for mac and cheese, hamburger, beef, and chicken rolls. The Sip Advisor’s favourite sushi order includes the California Roll (especially if it’s deep fried), Dynamite Roll, and Beef Teriyaki Roll. I know, how very North American of me! What’s your preferred sushi choice? It should be noted that a Japanese beer like Sapporo or Asahi is preferable for a Sake Bomb to truly bring that taste of Japan to your meal. Simply drop the shot of Sake into your brew and slam that sucka! To be honest, I didn’t even notice the Sake while chugging this drink down. I think it would have been pretty light regardless, but all you really get is the beer.